Ok, so I did my first 5-1 cycling today. I am not a cyclist but looking to learn more about the physiology of assessment. I've read through lots of posts but rarely are any results the same. -the drop in THb at the beginning of each recovery, suggesting some venous compression? 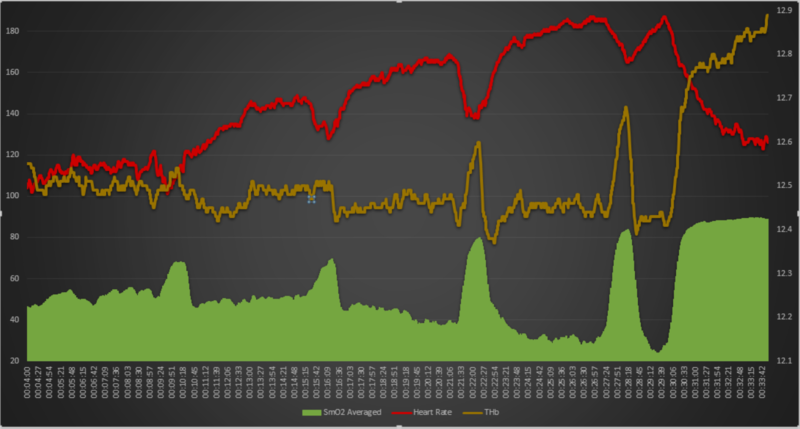 -Overall downward trend in THb as the test goes on, even more noticeable in the final stage. Could that be a respitory limitation? I'm thinking metaboreflex limiting blood flow to working muscle despite increasing demand. I was breathing heavily at this point. -heart rate is slower to recover at the end of the 4th stage and slow to rise at the beginning of the 5th-possibly supporting the respiratory limitation as there was O2 demand elsewhere causing HR to remain elevated? I'd be grateful for other's interpretations and suggestions! I'm planning on repeating this test, perhaps with smaller wattage jumps and with a second moxy on a non involved muscle, a have another on the way. - You only have 1 Moxy? - What muscle have you analyzed? If you want good results, you should do the same test on different days if you only have 1 Moxy, (for example, Monday - Wednesday - Friday). It is important that you keep the same cadence, a normal cadence (between 75 and 85rpm). 4 minutes are enough to create the metabolic deficit needed to analyze. You should analyze the vastus lateralis, rectus femoris and hamstring. Our clients have performed the test on different days and the results are the same. There is no variation (insignificant). Are you a cyclist, investigator or coach? I'm a coach with strength and conditioning background. I prefer a higher cadence around 95 and was +/- 5 rpm for the whole test.